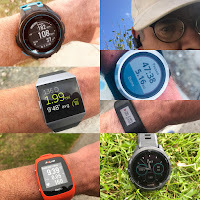 Road Trail Run: First Run Impressions! Skechers Performance Introduces GO Run Max Road 4 Hyper-A Super Light, Max Cushion Trainer: Fire on Ice! First Run Impressions! 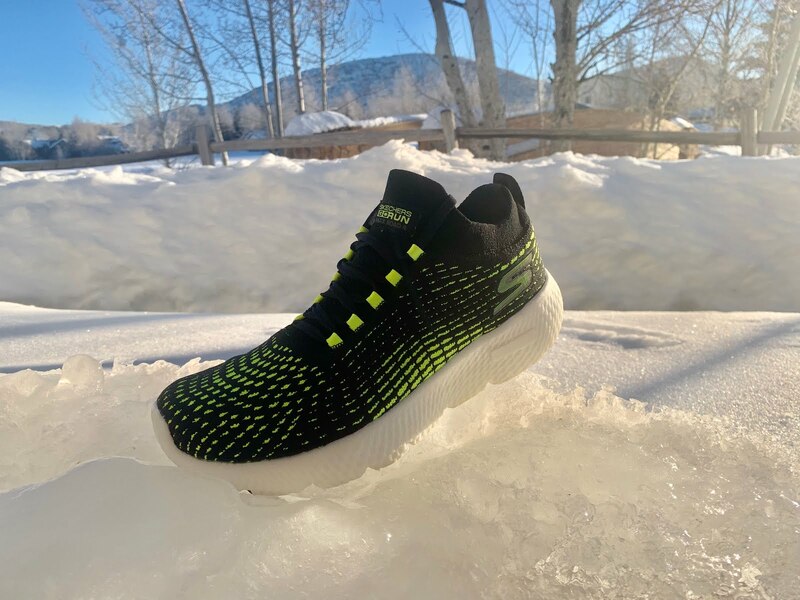 Skechers Performance Introduces GO Run Max Road 4 Hyper-A Super Light, Max Cushion Trainer: Fire on Ice! Introducing the max cushioned Skechers Performance GO Run Max Road 4 Hyper, announced today at Outdoor Retailer. Coming Fall 2019 with an expected MSRP $125. It features a Hyper Burst midsole and a flat knit upper. I have been wearing testing Max Road 4 Hyper. This very light, maximally cushioned trainer is a joy to run. It almost seems impossible that such a light shoe (my latest prototype weighs 8.4 oz / 238 g, right on the listed spec) can have so much springy and zingy cushion, plenty of stability, reasonable flexibility and go fast feel. I have tested many versions as Skechers Performance tuned the platform and upper based on feedback. I am particularly pleased with the support and comfort of the multi zone stretch knit upper in the latest prototypes. I've noticed the new uppers have a lot of volume in them and don't lock down the best. I had to return a pair of GoRun 6s due to a sloppy fit (and I loved the 5s). Is this improved in the newer versions or is it still very roomy? Is this finally a serious contender for Clifton OGs? Exactly! Although the cushion is denser and more stable than OG Clifton. I found OG Clifton very unstable and soft at the heel, strange pains I never get with that one. Not so here. Tried the Gorun Ride 7 last year and pleasantly surprised, it is my current daily trainer now compared to NB 890, Brooks GTS 17, and Zante 3. Excited to see what to come from Skechers this year. How the new Hyperburst compared to the Flight gen from last year? do you think this will be a good marathon shoe? I think an excellent marathon shoe especially on a hilly course. The cushion to weight ratio is very high and while not a snappy race type ride a protective and forgiving one. As you mention GRR 7 Hyper Burst plus the new outsole design makes the new Max Road more stable. I found the GRR7 quite unstable at the forefoot. Hyper Burst itself is a bit denser in feel with less of a rubbery bounce compared to Flight Gen. As far as cushion I think it is superior as the make up keeps the midsole from deflecting as much so smoother in feel front to back and of course lighter. For other insights into Hyper Burst see our review of the Razor 3 Hyper at the link below. 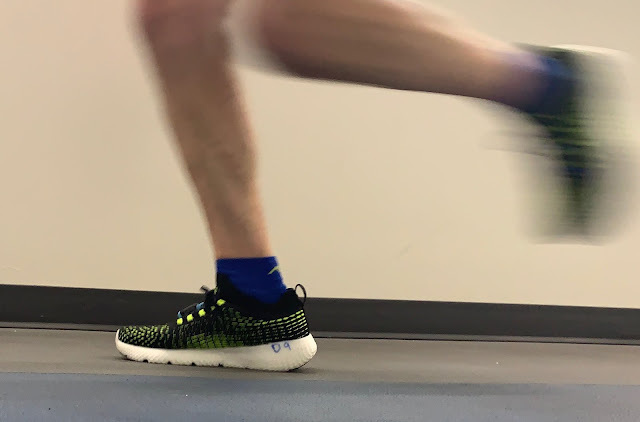 The big difference in addition to more stack for me having run both is that the Max Road has a far better heel outsole which helps prevents bottoming out if on the heels. 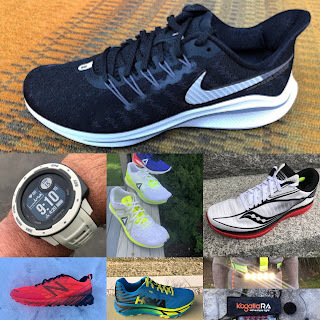 How does this new shoe compare to the predecessor, the Maxroad 3 Ultra? That's currently my long run/recovery shoe, and the cushion to weight ratio is pretty great there as well. 2) It looks like Skechers Performance finally hired some shoe designers...the aesthetics on this look fantastic! Keep up the great work! Your site is one of my go-to consults before I add anything to my rotation! I am a big fan of the last two road models. I liked the 5Gen in the Ultra Road 2 better than the Flight Gen in the MaxRoad 2 because it seems softer and less bouncy. I do like the upper on the MaxRoad 3 better than the Ultra R2 because it has a bit more width and a better toebox. Is the new models cushioning as soft as the last two models and it the upper as wide? Thanks for your great reviews! Looks interesting. Quick question/thought though: What good are all these new Skechers shoes if they don't manufacture them? I run exclusively in 4mm drop, lightweight, neutral shoes. The new Razor looks great but nobody, including Skechers has them in stock except in very small sizes. When they are good I love Skechers shoes but they seem to have a consistent problem with quality control and manufacturing in general. Again, what good is it offering desirable shoes if they aren't available for purchase? I didn't really want to have to post this here but do you have any contacts at skechers that can assist with a shoe return? Skechers received shoes that i returned on the 11th of January and they still haven't refunded me or replied to any of my comms. It looks like i am not the only person who has had this problem with getting a refund from them. Any help would be greatly appreciated. I'm a big Skechers fan, and am on my 3rd pair of Ultra Road-2. I ran a 50k trail race in the Maxtrail yesterday. But...I'm not a fan of the knit uppers, at least not in the way they are building them. I cannot "lock down" my foot in either the GoRun-6 or the Maxtrail shoes. There is no way to tighten the fit with the shoelaces without cutting into your foot. They need some sort of padded area where the tongue used to be, or maybe a burrito wrap system. And the heel counters in those two shoes do little to keep my heel from sliding around. They are very comfy standing or walking, and at moderate paced running, but anything uptempo requiring a snug fit isn't happening without ending up with pain on the top of your foot from the laces digging in. I'm still going to be getting Skechers, but the sloppy fit is making me look at Hoka again. Oh, I forgot to say that THIS shoe looks like it will be great! The upper looks more functional than the GoRun-6. I just hope they don't change the look from the prototype to the retail version like they did with the Razor Hyper; the zebra prototypes were SOOOO much better looking than the retail ones with "SPEED" emblazoned on them in a tacky, Walmart styling. do we know when this one will be released? Max Road 4 Ultra will be released later this year, most likely by summer. thanks! do you have any other info about Skechers 2019 fall lineup? Not definitively beyond expect Hyper Burst everywhere and the Speed Elite carbon plated race shoe will come to market at some point. What would you say is the biggest difference between Max Road 4 Hyper vs. GoRun 7 Hyper? Will you be doing some comparison between those two any time soon? I have run both quite extensively. The Max Road is a considerably more cushioned shoe. It's upper is also more secure. I would call it a super fine max cushion daily trainer. The GR7 is also a trainer but on the lighter side in support and cushion and better suited to faster shorter runs. We will have full reviews and comparisons of both when we Skechers gives us the green light. 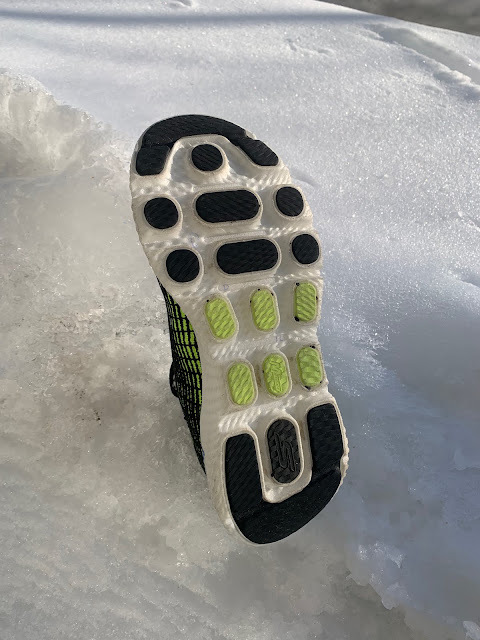 You can read some initial impressions of the Max Road 4 under Skechers at the link below.